A social media image purportedly shows flames and smoke from an explosion rising into the night sky in Tianjin, China. 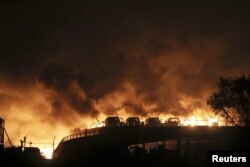 At least 17 people were killed and hundreds more were injured late Wednesday when a shipment of explosives blew up at a warehouse in the northern Chinese port city of Tianjin, sending massive fireballs into the night sky. There was no immediate explanation of what caused the blasts. 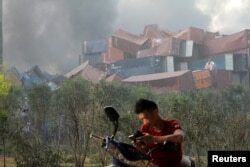 A man checks his mobile phone near shipping containers that were overturned by the force of two huge explosions in the Binhai district of Tianjin, China, August 13, 2015. State-run media said two explosions within 30 seconds of each other were so strong they registered at a nearby earthquake monitoring station. The explosions knocked doors off buildings in the area, shattered windows up to several kilometers away and left a massive mushroom cloud in the sky. Many people were thought to have been trapped in the warehouse after the blasts. One eyewitness said she was shopping at the time of the blast when "suddenly from behind there was a big fireball and explosion." She said "nearby cars and buildings were shaking, a few buildings' glass all broke and everyone started to run." People who witnessed the explosion posted pictures and videos on Chinese social media outlets showing massive plumes of fire and smoke that dwarfed nearby high-rise buildings. The videos also depict an enormous shockwave that rattled buildings several kilometers from the blast site. Vehicles are seen burning after blasts in the Binhai district of Tianjin, China, August 13, 2015. Tianjin is a port city in northern China, about 150 kilometers southeast of Beijing, and is home to more than 7 million people. It is China's fourth-largest city.